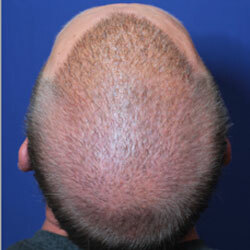 A man who started losing hair very early at 17 ended up having 3 FUT or strip transplants, and 3 FUE hair transplants. He has been wearing his hair short to better blend his thin native hair with his thicker transplanted hair. With such early hair loss and multiple transplant surgeries, he has been highly DHT-sensitive his whole adult life, but only started using the DHT-blocker finasteride 5 years prior to his first consultation with us at age 39. Even with multiple hair transplants and remaining thinning native hair, hair density can appear sparse. By thickening thinning hair and stimulating healthier growth with Hair Regeneration, scalp density can still be improved to look more natural. We treated him Hair Regeneration at age 39, and we reviewed his final results after 14 months at age 40. During his time between treatment and follow up, he felt his hair growing thick and strong enough to change to a longer hairstyle. He happily told us that his hair has not felt this healthy in over 20 years. 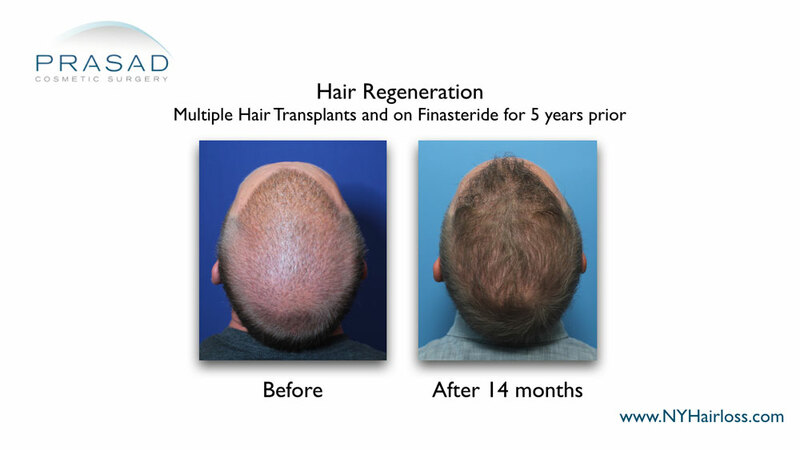 This case shows that even with early onset of hair loss, and multiple transplants, hair thickness, density, and coverage can still be improved with the Hair Regeneration treatment.